The Tennant S20 ride on sweeper sets the standard for compact sweeper performance, safety, and value. With the sweeping power of a mid-size and the manoeuvrability of a compact, the S20 goes where you need it and gets the job done. The S20 SweepMax system removes the majority of dust and moisture for superior dust control, longer filter life and extended sweeping time. The Tennant S20 ride on sweeper was engineered with a focus on safety – for the operator, the environment, and your employees. Important safety features include excellent operator sightlines, steering wheel-mounted horn, standard headlights and tailights, hopper support arm and the Thermo-Sentry. This 3-stage system filters sub-micron dust particles to a MERV 13 rating on the ASHARE 20 point scale. Reduce down-time, service time and maintenance costs by quickly accessing the heart of the S20 with no-tool easy-to-open covers. Spacious operator compartment incorporates adjustable seats, propel pedal, and steering column to customize fit. Important design safety features include excellent sightlines, side brush visibility, all levers forward sweeping, parking brake on light alert and much more. Greener alternative. High productivity cleaning of large areas with a quiet, fume-free battery version, eliminating engine exhaust.Improve productivity with a 62” (1575mm) sweeping path that shortens cleaning time by adding optional dual side brushes and a high capacity debris hopper. 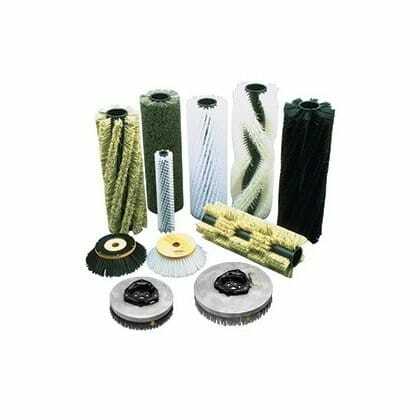 Sweep corners and hard to get at spaces with side sweeping brushes that extend 7” (180mm) beyond the frame to give outstanding results in all environments. Increased safety and effective operation in the most severe environments with an optional overhead guard or the optional soft side cab that can be installed or removed in minutes to adjust for changing weather conditions. Clean off aisle and in tight spaces with the convenient optional vacuum wand, stored securely on board so it is always there when you need it. Minimise risk of damage and machine repair costs in harsh environments with optional tower bumpers that protect against accidental contact with hard objects. 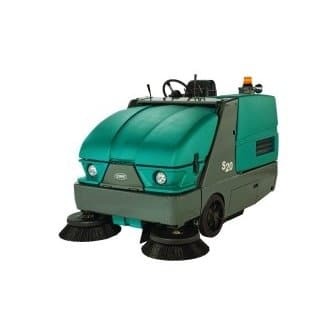 The Tennant S20 LPG sweeper is also available with an LPG power source, you can also view the larger Tennant S30 sweeping machine.